Project management offices (PMOs) today have a range of tools to help them not only to complete projects, but ensure these are aligned with organizational goals. PMOs today also do more than implementing projects; they are now accountable to budgeting, resource allocation and strategic alignment. These responsibilities in mind, PMOs rely on cloud project management solutions that give them the following: visibility, scalability, visualization, collaboration, accessibility, integration and mobility. In fact, if we look at the top cloud project management software today, they encompass these features. They can present the project’s progress in dashboards or drill down to specifics with a few clicks. They can immediately scale features for complex projects. They can generate visual charts and graphs. They have communication and collaboration tools that can integrate with other business apps and accessed from smartphones. It wasn’t a single stroke of event, however, that delivered these powerful tools to PMOs. In this article, we’ll look at how these features came to be, the history & development of PMO tools and trends for the future. PMOs as a business unit had their origin in the use of scientific management method introduced by Frederick Taylor. In 1909, he published “The Principles of Scientific Management.” He was the first to scientifically connect efficiency to optimization, that working hard isn’t the key to get things done, but working right is. Fast forward to the thirties, the U.S. Air Corps designated a project office to track its aircraft development. Many believe this is the first recorded expression of a PMO. The U.S. would build on this, and by the fifties, the Navy would adopt and popularize the work breakdown structure (WBS) as a project management approach, when it was building the Polaris missile defense. By the early eighties, PMO trends in business applied primarily to enterprise But with the popularity of PC and the global economic boom spurred by I.T., smaller companies started to search for more efficient ways to to manage projects. As these companies took in more projects, they were unprepared. Delays, cost overruns and overall project quality were prevalent. There’s a need to standardize approaches and methodologies and better coordination among project stakeholders. Events would lead to the popularity of professional associations and certifications. The eighties would give us Theory of Constraints, Scrum as a project management methodology, PMBOK and PRINCE. At the core of these schools of thought is project visibility, the ability to map out paths and monitor progress at different project stages. 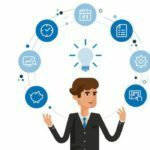 The concept of PMO as we know it today really took shape around this time, with no small effort from industry players like PMI and IPMA agreeing what it is, how it fits an organization and what it is supposed to do. Around this time, too, the stereotyped project manager also took shape, one who would forever etched in staff’s mind: someone who can’t do so he or she teaches; who plays by the book; and armed with certifications from an alphabet soup of acronyms. These stereotypes were borne out of standardization; in truth, these labels mirror the role of project managers: his or her job is to manage not do tasks; he or she sticks to proven methodologies; and his or her skills are validated and vouched by experts. Decades hence, the image of project managers, the delegator as opposed to doers, would be further validated by success stories in Silicon Valley. We would know more of Bill Gates not Paul Allen, Steve Jobs, not Steve Wozniak and Mark Zuckerberg, not Dustin Moskovitz. Back then, the digital revolution in the eighties though would be expensive for small and mid-sized companies. The systems were enterprise, cumbersome, proprietary and managed by an IT department. PMOs needed a winning software product that would democratize project management tools. And Microsoft had just the tool. The nineties saw the rise of Microsoft Project as the holy grail of PMO tools. The decade before it had PMOs dreaming of getting their hands on enterprise solutions that, by far, were the province of huge companies. And now they had Project off the shelf. Project would shape the functionalities of future plug-and-play project management solutions. It had at its core, modules that solutions today are built around. Project would assist managers to develop a plan, assign resources, track progress, manage the budget and analyze workloads right from their PC. Interestingly, PMOs have eggs Benedict to thank for. The seed that would grow into Microsoft Project is traced to a former IBM employee, Ron Bredehoeft, who imagined in mid-eighties how project managers would prepare eggs Benedict. The idea led Bredehoeft to work with Microsoft, which bought all rights for its 1984 DOS version. But Project would take a decade more to get traction. The solution had the performance, but it’s lacking one essential feature that we enjoy now: visualization. Project would only really take off when it released a Windows 95 version. By then, PCs were already a ubiquitous office equipment and graphical interface was the norm. Word and Excel were the standard by which user experience was benchmarked. Small and mid-level PMOs with a PC, a huge untapped market as of yet, were eager for their killer app. In reality, PMOs were already using and grown to like a killer app even before getting their hands on Project: Excel. It is designed to replace spreadsheets and suited PMOs. Project managers could visualize graphs and charts. Users were experts in macros to cut repetitive tasks. Already, we were seeing two universal features, visualization and automation, in project management solutions at this time. At this time, too, Microsoft had two of the most used PMO tools and had another tool in coming that would make up the trinity of project management tools of this era. Automation back then was more of a suggestion. PMOs had to work around the available tools in those early days, mainly Excel and Project, to automate workflows. Project plans were created in Project, stored a server and exported to Excel and macros had to be created. The concept of a single location for all project data was a dream. 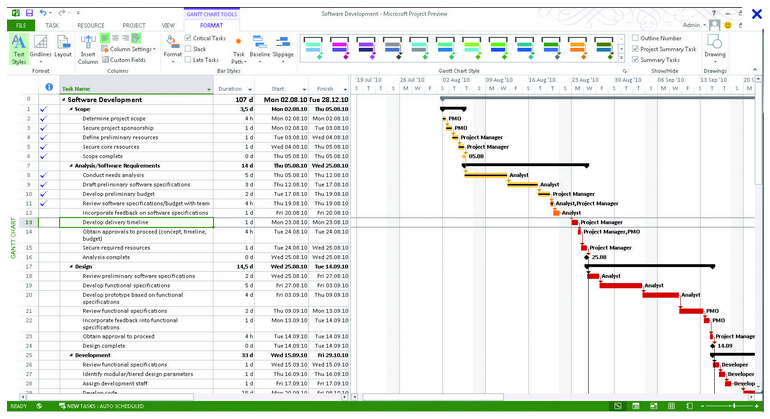 PMOs would still be using Excel for macros and Project to create Gantt charts. Executives found the whole mashed-up data confusing and too cumbersome to get the whole picture. So PMOs started creating PowerPoint slides, adding yet another layer to their already loaded system stack. To top it all, you can’t teach old dogs new tricks, even less of a chance, wean project managers from their favorite tools. So you would see a project team of young professionals using Excel, Project and PowerPoint, while their middle-aged managers would stick to boards with magnetic pins or Post-It notes in candy colors. It’s easy to view these as relics of the pre-digital revolution age but, truth be told, they would spur yet another revolution in PMO history. The use of visual ticklers had been around since ages ago, beyond one’s grandfather’s time, yes, like ancient Egypt. Hieroglyphics were discovered depicting an organogram. It showed how different teams were allocated and roles were defined. In fact, it is believed each side of the pyramid had its own project manager. The ancient Egyptians were clearly practicing WBS. The candy-colored boards didn’t go away in the face of Excel, Project and PowerPoint because they’re adaptive. If John fell sick for a week, for example, you could easily move his priority tasks under Peter, and shelf off Peter’s non-priority tasks. Delays are avoided. Microsoft Project was still lording it over PMO tools, but by early 2000s, there’s a clear need to incorporate visual boards, not just Gantt charts, for the big picture. The boards would become a major key feature in top project management solutions of today. Around 2001, a group of software developers met in Snowbird, UT to think up how agile methodology applies to software development. They wrote the Manifesto for Agile Software Development. Functional software over robust documentation. Customer collaboration over contract terms. Responding to change over sticking to plan. Today, you hear from vendors of intuitive interface, dashboards, collaboration tools and scalable plans. The manifesto didn’t develop these concepts; what it did though was to pull these priorities together and apply them to software development. And it worked, that, in fact, the manifesto would define what a great software solution is today, not just in project management, but in other software categories, too, like sales, marketing and support. The introduction of Salesforce in the early 1999 would send ripples across business processes. Cloud computing had arrived to small and mid-sized businesses. The idea of accessing a system via website was exciting and would be adopted across business processes. But it’d take a few more years before PMOs got their real shot at the cloud. Sales and marketing solutions and cloud business and productivity apps led by Salesforce, Amazon and Google would popularize first cloud computing, before the technology caught fire among PMOs. For project management, SaaS solutions for teams would gain traction around 2008. PMOs would enjoy a wide range of options from hereon, as vendors vied for market share. But external factors were also at work that made cloud computing more efficient than on-premise. A year earlier, a device was launched by Apple that would also enhance cloud computing: iPhone. In reality, it isn’t a phone but a computer tucked in your pocket. Furthermore, with plenty of business apps in the market by this time, we would also be conscious of another key feature in project management software: integration. Spurred by the ubiquity of project management tools, its ease-of-use and low capital entry points, companies started using these tools as a collaboration platform across departments. Today’s solutions can handle almost anything that involves planning, collaboration, scheduling and managing. A marketing campaign can be managed by utilizing project management boards to move tasks from To-do, to Doing and to Done. A business strategy can be captured, organized into subtasks and tracked for milestones inside a project management interface. HR can also turn to project management software for talent management. Along with CRM, project management is arguably one of the few software niches that have absorbed other niches. A typical project management solution today has modules for task management, communication apps, collaboration tools, time-tracking widget and project accounting, all of which belong to their respective software categories. What do all these suggest of PMO’s role? While PMOs are cross-function groups, they are also being absorbed into other departments. In fact, companies started to regard project management skills as key to managerial positions, instead of a standalone role. U.S. News, for example, classified project management as one skill to earn a well-paying job. Whether you’re a CEO, CIO, CMO, marketer, operations supervisor, HR manager or events organizer, you’ll be utilizing project management tools. Today’s PMOs have a full-service outlook. They are strategically aligned with the organization’s overall goal. They provide support to project stakeholders, from the team member on the ground to the investor in another country. They are agile and highly collaborative, able to adjust to changes while keeping to the deadline. And they are one of the most digitally competent units outside of I.T. and ready for more PMO trends in the coming years.